Meconi, professor of music in the School of Arts and Sciences and professor of musicology at the Eastman School, offers an overview of major issues in medieval performance practice as part of Ashgate’s Library of Essays on Music Performance Practice series. Meconi is also the author of commentary accompanying Extreme Singing: The La Rue Requiem and other Flemish Masterpieces of the Renaissance, by the Ann Arbor–based a cappella group Vox Early Music Ensemble (Self-published, 2011). Analyzing responses to her own national survey of American pastors’ wives as well as results of six other surveys, Alder distills advice on the “joys, the challenges, the discouragements and the success strategies” of women married to ministers from a variety of denominations, geographic regions, and age groups. Alder is a professor emeritus of biology at Roberts Wesleyan College and ordained as a pastor. Her husband, father, son, and son-in-law are pastors. Li, assistant professor of English at Rochester, argues that American politicians and writers of color have adopted a new means of talking about race: one that avoids explicit references to race in favor of terms that carry cultural resonance within specific racial groups. The book explores literary works by Barack Obama, Toni Morrison, Jhumpa Lahiri, and others. Jörgensen, professor of Spanish at Rochester, explores 20th-century Mexican nonfiction literature—such as autobiographies, memoirs, historical essays, and testimonies—as responses to the natural and industrial disasters and political and social unrest that overshadowed Mexican life in the last century. Wolpert, a chip back-end design engineer at IBM, and Ampadu, associate professor of electrical and computer engineering at Rochester, coauthor an overview of new methods for controlling the effects of temperature on nanoscale circuits and systems. Stern, a composer, professor of music at the Ariel University Center, and music critic for the Jerusalem Post, offers an overview of the influence of the Bible on the history of Western music. The book explores key biblical characters and themes across genres of music, including traditional, folk, liturgical, popular, classical, and contemporary. Drawing on music reviews, news stories, and interviews with Jackson and major collaborators, Vogel, a doctoral candidate in English at Rochester, traces the development of Jackson’s music in its social and historical context. Mannheimer, assistant professor of English at Rochester and a specialist in 18th-century print culture, explores the uses and meanings of elaborate typographical design among satirists such as Alexander Pope, Jonathan Swift, and others. Kester, professor of art history and chair of visual arts at the University of California at San Diego, argues that the global proliferation of collaborative art in the past two decades is fostering a redefinition of artistic autonomy, representing an important transition within the continuum of the avant-garde. Beemyn, director of the Stonewall Center at the University of Massachusetts at Amherst, and Rankin, associate professor of education at the Pennsylvania State University, examine the varied experiences of gender nonconforming individuals in the United States today through interviews with transgender people. South Florida hairdresser Marla Shore returns in a new installment of Cohen’s Bad Hair Day Mystery series. A friend’s wedding turns into a funeral when Marla, a bridesmaid, finds the matron of honor dead under the cake table, the cake knife protruding from her chest. Hays, professor emeritus of English at the University of California at Davis, surveys the history of the critical reception of The Sun Also Rises from the novel’s release in 1926 to the present as part of Camden House’s Literary Criticism in Perspective series. Paxton, the founder and CEO of Advanced Document Imaging, offers a guide for professionals working with large surveys, data capture, and processing, on how to extract data from forms, both accurately and cost- effectively. The book is based on Paxton’s work with the U.S. Census Bureau on both the 2000 and 2010 censuses. Gavitt, associate professor of history at St. Louis University, examines the evolution of charitable institutions in Florence during a time of social unrest and growing economic inequality. While new institutions formed and old ones expanded, elite Florentine families guided this process to maintain their wealth, power, and prestige, Gavitt argues. The Sacramento Choral Society and Orchestra, led by founding conductor Donald Kendrick ’85E (DMA), perform Verdi’s Requiem live at the Mondavi Center of the University of California at Davis in March 2011. The group also recorded a live performance with the Sacramento Children’s Chorus of Carl Orff’s Carmina Burana in 2010 at the Mondavi Center. The pianist Silverman performs Brahms’s Variations and Fugue on a Theme of Händel and Schumann’s Symphonic Etudes. Silverman also released Complete Mozart Sonatas (IsoMike) in 2010. The jazz trio that includes Damon Zick ’97E (tenor saxophone and bass clarinet) performs a mix of jazz, blues, folk, and pop. Zick also performs with the world music group Quarteto Nuevo on their self-titled recording (Quarteto Nuevo, 2010), which features a mix of Middle Eastern, Indian, Mexican, and flamenco music. Woodwind performer and composer Kono leads a sextet in his debut recording. The sextet includes percussionist John Hollenbeck ’90E, ’91E (MM). Kono is the woodwinds chair in the musical Jersey Boys, now in its sixth year on Broadway. Pianist, singer, and composer Kahmann performs 14 new original songs. Collision is volume six in The Kahmann Touch song series. 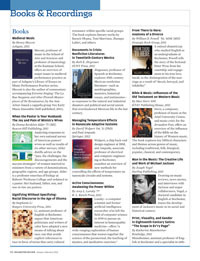 Books & Recordings is a compilation of recent work by University alumni, faculty, and staff. For inclusion in an upcoming issue, send the work’s title, publisher information, author, and author’s class year, along with a brief description, to Books & Recordings, Rochester Review, 22 Wallis Hall, P. O. Box 270044, University of Rochester, Rochester, NY 14627-0044; or by e-mail to rochrev@rochester.edu.